Art opening reception: Ladies and Gentlemen …The Beatles! Fifty-one years ago, The Beatles arrived in America for the very first time to a sea of adoring fans with a serious case of Beatlemania. The fever of the time has been captured in Ladies and Gentlemen ... 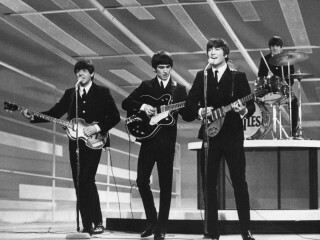 The Beatles!, which covers the peak of Beatlemania in the United States, from 1964 through mid-1966. View more than 400 pieces of Beatles relics, from records and photographs to rare pieces like the drum head Ringo Starr played during the band's famous appearance on The Ed Sullivan Show. Opening day festivities include free admission, live music by The Eggmen and fare from local food trucks.